AgroWeb South Eastern Europe, as part of the AgroWeb Network is an interactive portal for agriculture information and knowledge sharing on rural and agricultural development and integration to the world agricultural community. AgroWeb SEE portal aims to link people and organizations within the SEE region with international organizations to promote mutual exchange of information and generate, share and use agriculture-related expertise. We also promote expansion of Internet services in support of rural and agricultural development. We are working for different types of stakeholder. Primary stakeholders include farmers and other participants in projects and programmes. Secondary stakeholders include local governance institutions, extension services, NGOs, and private sector organizations. Tertiary stakeholders include national-level development agencies, national NGOs, policy makers, decision makers and international donor agencies. The annual programme is co-financed by the DG AGRI in the frame of the call for proposal 2006/C 236/07 about information actions on CAP and by the Regional Board for Agriculture in Sicily. “Cross-compliance: a resource for market support in agriculture” - the project's Video Conference connecting the 14 rural districts of Sicily and other rural areas in Italy, Portugal, Spain, Latvia, Bulgaria, Slovakia and Romania. the 14th Congress on Alternatives to Animal Testing and the 11th Annual Meeting of MEGAT – Middle European Society for Alternative Methods to Animal Testing will be held at the University of Linz, Austria. The program includes lectures and posters-sessions about the following main-subjects: 7th Cosmetics amendment, Computer assisted procedures, Ecotoxicology, Endocrine disruptors, Ethical and legal aspects in animal experimentation, EU-chemicals policy (REACH), Evidence-based toxicology, Free Communications, Good Cell Culture Practice, Nanotoxicology, Revision of agrochemicals directive, Revision of directive 86/609/EEC, Vocational training, Poster sessions. This workshop and stakeholder consultation was attended by 35 selected representatives from research, extension and agricultural technology centres, Ministries and FAO consultants and including 28 representatives from Albania, Bosnia and Herzegovina, Bulgaria, Montenegro, Romania, Serbia, The Former Yugoslav Republic of Macedonia and UNMIK-Kosovo. The participants focussed on the challenges and trends in agricultural research, education and extension in the West Balkan Region. Under the organisation of the Institute for Cooperative Studies Berlin and the Institute of Agricultural Economics Sofia, between 9-13 of October 2006, the Bulgarian partner will host a Marie Curie Training Course on Cooperatives in Transition Countries. 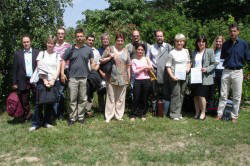 This action is part of the MACE Project (Modern Agriculture in Central and Eastern Europe). The First Announcement flyer can be downloaded here. Contact and further details are presented inside the available flyer. Second call is now available here. 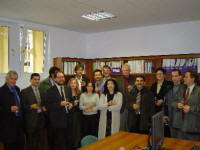 Between the 19th and the 21st of July FAO SEUR will organise and host the Expert Consultation and Video Conference - Development of Thematic Networks in the CEE Region Based on State of the Art Agricultural Information Standards & Tools within the FAO SEUR premises, 34 Benczur utca Budapest, Hungary. The Second Steering Committee Meeting of the Tempus Cards Project IB_JEP_19027_2004 "Balkan Agri-Sector Initiative for Capacity Building – BASIC" will be hosted by the partner University of Ljubljana the 6th and the 7th of July 2006. The International PROGIS-Conference 2006 will take place on April 19 - 20 in Vienna. The event explores background, legislation, needs and technologies for farm advisory systems, as they are necessary to comply with the new situations like commitments regarding Cross Compliance, documentation needs to ensure food- and feed-traceability, to calculate, to map etc. The set up of public or private farm advisory services (FAS) is binding from 2007. Few states have already installed systems, but most of the member states are still evaluating how to manage them best. FAS are on one side a challenge for national ministries, on the other side an excellent chance for agri-entrepreneurs picking up this new business segment …… perhaps suitable to your activities? There are further “winners” of this regulation. The farmers, who will get grants for claiming FAS – that means qualified advise (if advisors have an excellent technology) for low money. PROGIS will present its integrated AGROffice-technology as it is applicable to any of the mentioned fields of business activity. AGROffice comprises next to mentioned tasks, issues like economy, ecology, logistics, precise - and virtuell farming, forestry etc. Many of them “global issues”, that’s why our partners from Germany, UK & Ireland, Slovakia, Spain, Bosnia & Herzegovina will present their excellent successes in their countries with PROGIS technologies as well as experts from throughout EU will present their views to the mentioned topics. You as a participant will profit of all these views. Join us in Vienna – the prel. program is online and the registration is open at: http://www.progis.com/event/conf2006/progis_konf/index.htm This event will help also players in global markets like the industries food/feed, agro machines, fertilizer and herbicides, seeds etc. to prosper based on new technologies! Between the 1- 3 June 2005, Szent Istvan University, Godollo, Hungary will host the FAO workshop on Improvement of Information Exchange between Education Institutions in the SEE Region. The workshop was organized with the aim to enable users to enhance the communication and information exchange aspects of their communities using electronic networking. Strengthening of operational mechanisms related to food and agricultural information management; the improvement of the co-ordination of capacity building efforts; the development of international content management standards, and other efforts to increase the use and dissemination of agricultural information were among the key topics.